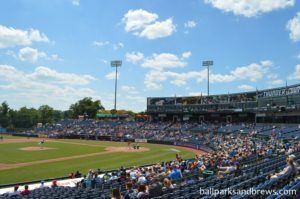 Ballpark Basics: A ballpark perched on the banks of the Delaware River. Ballpark Breakdown: Walking up to the entrance of Arm & hammer Park you are greeted by regal brick facade with a rounded metal roof. After you enter the gate you climb a large set of stairs to get up to the concourse. The concourse is covered by the suites above and is open to the field. The suites wrap around the infield and offer the only shade in the entire ballpark as there is no cover over any of the seating bowl. 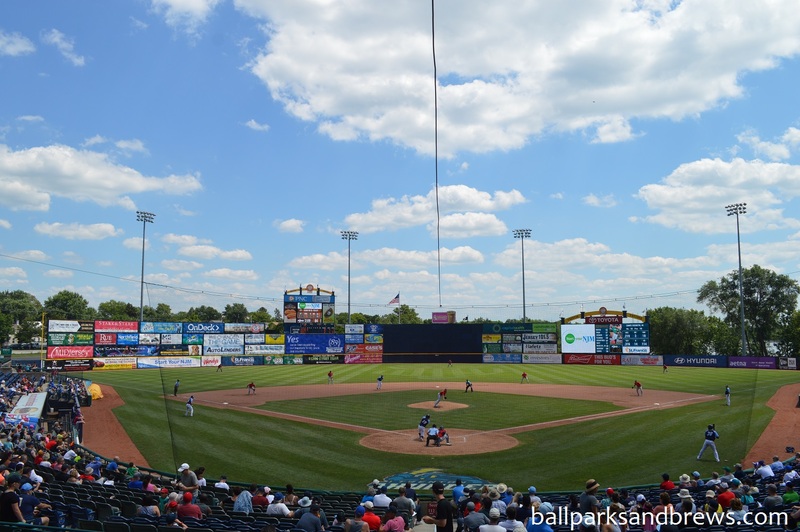 The concourse does not go around the entire field due to its proximity to the Delaware River that floats behind the right field wall. 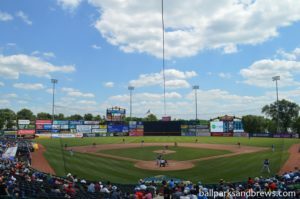 The Delaware River is one of the more unique aspects of Arm & Hammer Park. Running behind the right field wall it is close enough that home run balls regularly end up in the river. 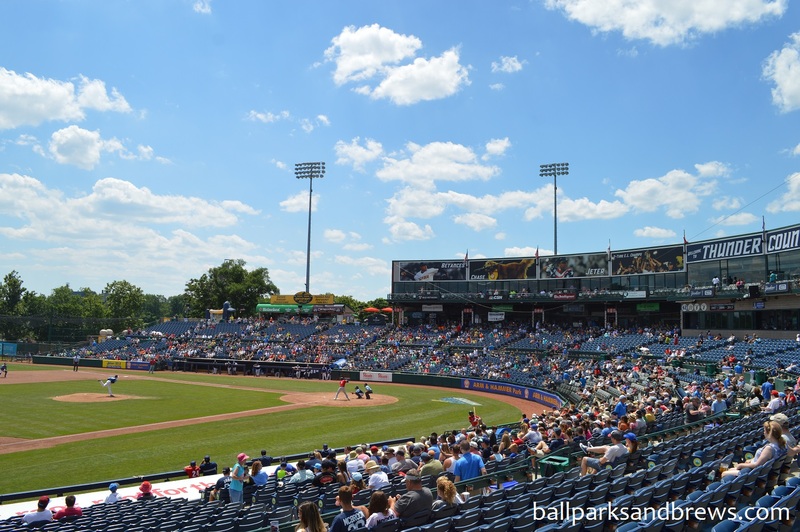 There are spaces for groups down the left field line with picnic tables lined up along the concourse as well as an additional picnic area just below. The Family Fun Area takes up much of the concourse in the right field corner. Trenton is a Yankee affiliate and they do a good job of incorporating the team throughout the park with banners of players that have come up through the system (or had a rehab stint) with the team. You will also see many a Yankee shirt or cap in the crowd as this is firmly in Yankee territory. Best Spot For Beer: Most of the concession stands have the same options for beer. During our visit they had some specialty beer carts on the concourse directly behind home plate. 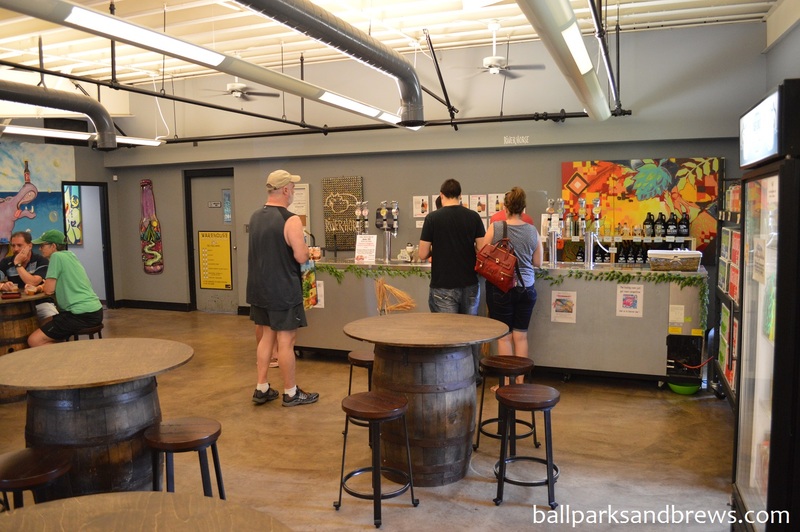 For the 2018 season they added the Craft Corner on the third base side, a new beer cart with a large selection of local and regional craft beer options including Victory Brewing,, Vault Brewing, Spellbound Brewing, Brooklyn Brewing, and Ship Bottom Brewery among others. 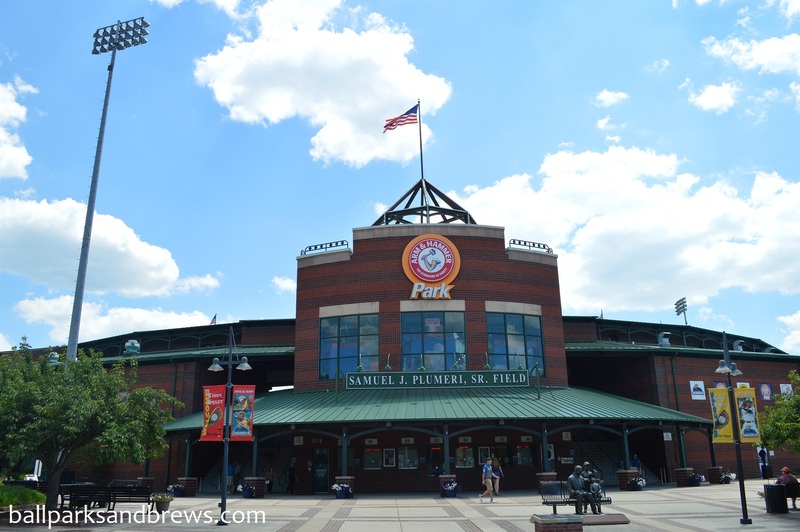 Arm & Hammer Park does a good job of incorporating their team’s history throughout the park. Making the Delaware River a focal point behind right field the team does a good job highlighting its unique location. With the addition of the Craft Corner helps put a spotlight on some of the local flavor near the park as well. 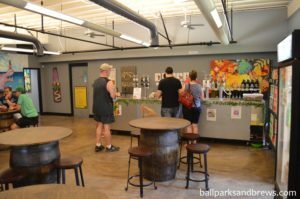 Brew Basics: Creative touches and a Ballparks and Brews approved hippo theme. New Jersey always seems to kind of do their own thing. Perhaps it has something to do with differentiating themselves from that other “New” state just northwest which gets a lot more press. In brewery terms, this translates to a law requiring anyone tasting in a brewpub to “attend a tour”. Any beer aficionado can tell you once you’ve attended a dozen plus tours, they really start repeating themselves. So, River Horse handles this requirement with aplomb, allowing for a variety of choices in 1980’s View-Master™ style. Yup, View_Masters¹. You have a rousing choice of “The Brewing Process”, “All About River Horse” and my personal favorite “Hippos are Awesome”. Seeing as hippos are my spirit animal, I went for that one while Jim learned more about the history of the microbrewery itself. 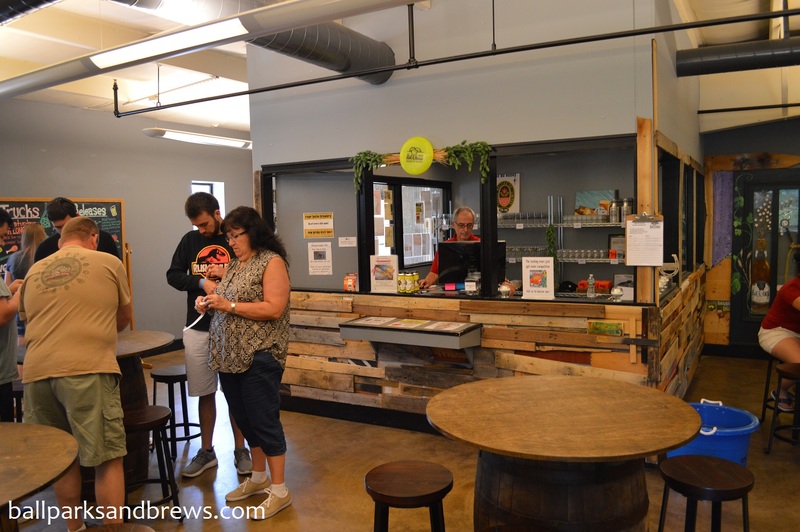 Of course, should you be so inclined, actual brewery tours start 15 minutes after the hour. 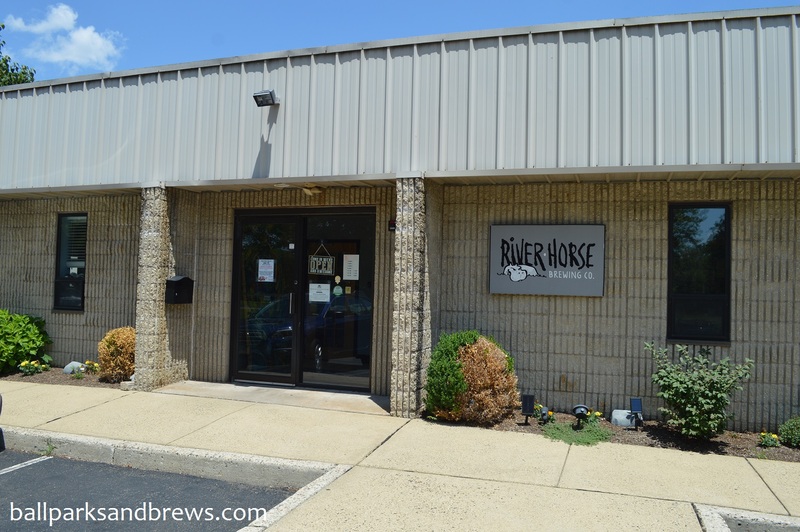 River Horse seems to have invested more in the brewing of the beer than the development of the tasting room, which is the ratio you’d hope for when a business is looking to build their brand in a market. The bar itself was basically a rolling silver cooler with a hop decor theme, and the register was a cashiers box in an office where you first walk in. Concrete floors and gray walls are softened by reclaimed wood accents, barrels repurposed as tables, and an adorable logo. 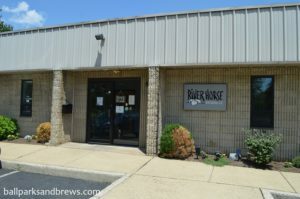 Brew Breakdown: They didn’t really have a tap list, in fact when we visited, the beers on tap were just printed on an 8.5 X 11 piece of paper that was taped to the wall. I may need to get my contacts checked, but I’ll tell you the list was fairly hard to read if you weren’t right up on the bar – and there was no drinking at the bar. There’s also beer to go, both cold and room temp, but it seemed like the singles were overpriced compared to what we had been seeing around the area. Once you’ve toured however, they have a pretty solid deal that gives you 4 tasters for six dollars. This is definitely the way to go. Summer Blonde (4.0% ABV): All of the beers on this list were very similar in color, an orangey-gold. So with that in mind, this one was just a shade lighter than the others. Smells and tastes like yeast with a cracker back. Wheat and citrus notes in the end. Tripel Horse (10% ABV): This boozy Horse has a strong aroma that is mostly orange peel and anise. The taste is equally boozy and sweet, which makes you feel every bit of the 10% abv, so much so that it was actually like a mead. Poured orangey-gold like the others. Farmer’s Daughter (5.9% ABV): This beer adds an interesting strawberry-rhubarb twist to your typical blonde ale. To begin, the fermented strawberry aroma that carries a good fresh berry sweetness, that is not syrupy like the Tripel Horse. The rhubarb mellows it and keeps this a light, clean beer that is hazier and just a touch more pink than either of the other beers we sampled. One of our River Horse favorites! Hippotizing IPA (7.5% ABV): This IPA had the same orangey-golden hue but was more carbonated than the others, so also had more lacing. The aroma was a good hoppy amalgam, but in true New England-ish form, the palate was more of a solid blend instead of being sharply punctuated by the hops; then finished with the slight bitterness you’d expect.